Say That Again...: Don't Touch My Stuff! So, I did some work in our closet. It looks great; it's all organized in a special way. I moved some of the clothes around, easier access. Well, my husband wasn't totally thrilled with my organizational skills. He didn't come right out and say that, but he was not overly excited. I didn't hear "good job, thanks for organizing the closet." 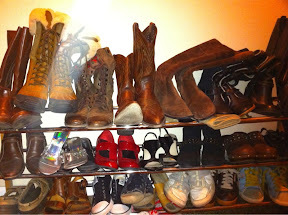 Instead, I heard, "is it easier for you to get to your shoes with the closet this way?" Hmmm, yes! "Don't you like the closet this way?" I asked. His response, "yes, I just might do a little readjusting, I don't like anyone to mess with my personal space." Puzzled, my mind goes into the state of wonder. "Personal space? The closet? Wow, I didn't know that! Sorry!" We got it all worked out, of course, and he left it as is. My shoes and boots are nicely aligned with the wall, for easy access. His clothes are hanging on two rods, high and low. It is a bit of an adjustment, for me because it's so clean and tidy. For him, because it's different. There have been those times that I have said the exact thing to God. "Don't touch my stuff!" I start to feel comfortable right where I am, and I don't really want to grow, or look at what needs to change. I don't really want to get tidied up, it hurts too much. God, naturally has a different opinion, but He isn't pushy, usually. He comes in with His skills, and slowly starts to point things out. He gently urges me to rearrange a few priorities, throw away a bit of garbage, invite generosity, clarity, and space into my life. Once I allow Him to start the process of tidying things up, I know it's the right choice. He has had to do this with my life a lot. Clean up my attitude, sweep out my views, vacuum the dirt and dust from my heart. He's had to add His fruit and His power and His voice. And, I've continually needed to surrender to His way of doing it all. It's much better for me, His way. It feels like that great wide open space in which I can run and play. Ah, it's relief, joy, peace, and love! I like it a lot, actually. I can see better. Say That Again, Jesus. Touch me, cleanse me, tidy me up!